Yesterday morning’s Senate Floor session was historic. The Democrat Caucus met at length, then conferred with a Republican Caucus representative, usually Republican Senate Leader Bates, reconvened again, and so forth. After more that two hours of this haggling as to whether to expel or suspend without pay, Senator Tony Mendoza had a staff member submit his letter of resignation to the Chief Assistant Secretary of the Senate. Our Republican Caucus requested to see the letter. We were informed that it was not accepted by the Democrat Caucus. Apparently, it appears that the President pro Tem wanted to expel Senator Mendoza for political purposes, as the California Democratic Party Convention is scheduled for this weekend in San Diego. Senator Mendoza’s resignation letter addresses this perspective. Since the Democrats were dragging their feet on accepting the resignation letter, we requested a copy from Senator Mendoza, who provided an electronic version, and I and many of my colleagues tweeted it out (see https://twitter.com/SenatorMoorlach/status/966759386512203776 ). Shortly after this maneuver was done, the Democrats reconvened the session, announced that the Senator’s resignation had been accepted, and promptly adjourned. There’s the drama. Please don’t make the mistake of assuming that the Republicans were politicizing this sad incident. But, don’t make the mistake that the Democrats were not. In the last four months, four Democrats have resigned from the legislature, thus removing their super-majority. God does work in mysterious ways. After the Senate Floor session was quickly adjourned, I was met by a large group from the media as I tried to return from the Chambers to my office. This historic event is covered in the three pieces below by Capital Public Radio, CBS Channel 13 Sacramento (which also aired on their LA affiliate stations), and CBS Bay Area, respectively, below. The fourth piece below is Volume 9 of the per capita analysis of the Comprehensive Annual Financial Reports of California’s 482 cities, which provides the cities from number 100 to 51. It also includes another 2 million people, or 5 percent of the state’s population, bringing us up to 80 percent of the state’s residents. This grouping includes four Orange County cities, Dana Point (#89), and three from my District, Laguna Woods (#100), Lake Forest (#86), and Laguna Beach (#55). For links to the other seven volumes, go to MOORLACH UPDATE — City CAFR Rankings – Vol. 8 — February 22, 2018. Volume 10 is next and will include the top 50 cities, which covers only 3 percent of the state’s inhabitants. The remaining 17 percent reside in unincorporated areas, which means they are governed by their county boards of supervisors, versus city councils. Democratic state Sen. Tony Mendoza is already looking to regain his seat after resigning amid sexual allegations on Thursday. A Senate investigation found that Mendoza “more likely than not” behaved inappropriately toward six different women, many of them former staffers. Mendoza told Capital Public Radio he felt the investigation was politically orchestrated by state Senate Pro Tem Kevin de León, who introduced a resolution to expel Mendoza earlier this week. Senate Rules met about the resolution and was set to bring a disciplinary action to a full Senate vote today. The former lawmaker is suing the Senate over the investigation, and plans to run for re-election in the primary this June. De León and Mendoza are former housemates. 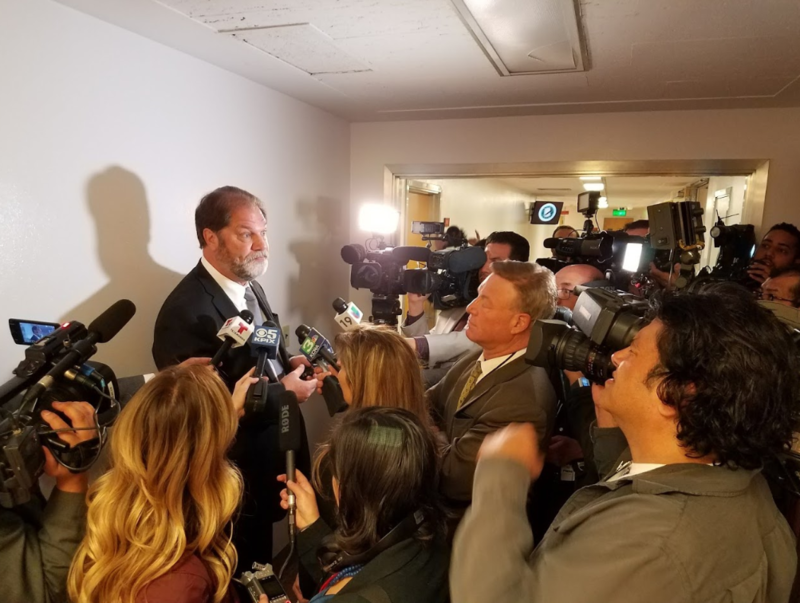 Republican Sen. John Moorlach, who represents parts of Orange County, said he and many of his colleagues thought Mendoza should be suspended until the end of session, without pay, and then be allowed to run again for office in June. On Thursday afternoon, Mendoza’s photograph was removed from the roster of senators in the hallway outside the Senate floor. SACRAMENTO (CBS13) – It’s the latest twist to a sexual harassment scandal rocking the legislature since October. Embattled state senator Tony Mendoza (D-Artesia) announced in writing Thursday, he’s resigning. The move shocked his own party and came minutes before senators would’ve had the final word on his fate. “A letter of resignation has been submitted,” said President Pro Tem Kevin De Leon (D- Los Angeles). A fiery letter of resignation from their former colleague Tony Mendoza, was passed around and studied with great detail. “We won’t tolerate abuse of power and a pattern of behavior that violates our harassment standards,” De Leon said. The Senate leader, who once shared a Sacramento home with Mendoza, met with senators for hours. It was a closed caucus. Lawmakers deliberated on a possible expulsion considered unprecedented in modern times. “The fact is that nobody has been expelled from the Senate in over 100 years — that was the last time it happened. There were three clearcut cases of bribery,” said Senator Ben Allen (D-Santa Monica). But this was a case of alleged sexual misconduct, investigated by an outside legal team, over a period of months. And the findings lawmakers say, were enough for Mendoza to lose support within his own democratic party. “I think that his colleagues were not there to support him. I think they wanted to have him expelled,” said John Moorlach (R-Orange County). But Mendoza isn’t calling it quits yet. The now ex-senator has already filed papers for another run for office. “So that he brings his case to the voters,” said Moorlach. Mendoza’s name may be on the June ballot. But it won’t be seen in Senate chambers anytime soon. His official picture was removed within minutes of his last-minute resignation. A senate seal now marks the third legislator to step down over harassment claims, in recent months. SACRAMENTO (AP) — A California state senator accused of sexual misconduct resigned Thursday just ahead of a possible vote to expel him, delivering a scathing resignation letter that called the investigation process a farce. Democratic Sen. Tony Mendoza of the Los Angeles area said he may still run for the seat this fall, putting his party in an uncomfortable spot. His resignation letter takes aim at the leader of the Senate, a fellow Democrat and Mendoza’s former roommate in Sacramento who was leading the effort to expel him. “It is clear that Senate President Pro Tem Kevin de Leon will not rest until he has my head on a platter to convince the MeToo movement of his ‘sincerity’ in supporting the MeToo cause,” Mendoza wrote. Senate President Pro Tem Kevin De Leon spoke sternly on the floor of the state senate about changing the culture of sexual harassment in Sacramento. Lawyers investigating complaints against Mendoza, who is 46 and married, found that he likely engaged in unwanted “flirtatious or sexually suggestive” behavior with six women, including four subordinates, a lobbyist and a young woman in a fellowship with another lawmaker. The investigation released Tuesday found he “more likely than not” engaged in behavior such as offering a 19-year-old intern alcohol in a hotel suite at a Democratic event, suggesting a young woman in a Senate fellowship take a vacation with him and rent a room in his house, and asking several women about their romantic lives. Mendoza argued in his resignation letter that the “more likely than not” was a low standard of proof not meriting a penalty as high as expulsion. He called the Senate’s process “farcical” and unfair. “I think his colleagues were not there to support him. I think they wanted him expelled,” said Sen. John Moorlach (R-Costa Mesa). By shortly after 12 p.m., Mendoza’s photo had already been removed from the gallery of state senator photos in the Capitol building. Mendoza has consistently denied wrongdoing and blasted an investigation that he claimed was unfair, illegal and racially motivated. His complaints illustrate the Legislature’s struggle to respond to growing demands for a change in a culture perceived as burying complaints and sheltering offenders. The Legislature still hasn’t adopted fair and transparent policies for sexual misconduct four months after dozens of women who work at the Capitol sent a letter calling for a change in culture, said Samantha Corbin, a lobbyist and co-founder of a group called We Said Enough that formed in the wake of the letter. Mendoza’s resignation was the best solution for the women who accused him of misconduct, but it hasn’t delivered justice or due process, Corbin said. Mendoza’s resignation letter was hand-delivered by an aide moments after the Senate Rules Committee lifted his suspension so he could return to the Capitol and publicly defend himself against expulsion. His photo was quickly removed from a wall showing the sitting lawmakers and replaced with the seal of the Senate. Mendoza wrote that he wasn’t able to see the evidence against him and was ordered to remain silent about the allegations. He said he couldn’t get a fair hearing with so many of his fellow Democrats running for higher office and thinking about their own political futures. Lawyers who conducted the investigation released Tuesday found that Mendoza “more likely than not” engaged in behavior such as offering a 19-year-old intern alcohol in a hotel suite at a Democratic event, suggesting a young woman in a Senate fellowship take a vacation with him and rent a room in his house, and asking several women about their romantic lives. Mendoza had taken leave and then days before he was set to return in January, the Senate Rules Committee suspended him because the independent investigation had not yet concluded. He doesn’t plan to drop a lawsuit he filed last week seeking reinstatement. He alleged his suspension was unconstitutional, among other arguments. Elected officials need to hold themselves to a higher standard, and the Senate doesn’t need to hold itself to the same standard as a court of law, said Kim Nalder, director of the Project for an Informed Electorate at California State University, Sacramento. The Senate could be challenged again soon. An investigation has concluded into Sen. Bob Hertzberg, whom at least three female colleagues say made them uncomfortable with hugs. The findings have not been made public. Two other Los Angeles-area Democratic representatives, Raul Bocanegra and Matt Dababneh, resigned last fall. Assemblywoman Cristina Garcia has taken leave after she was accused of groping.